Pope John XXII (Latin: Ioannes XXII; 1244 – 4 December 1334), born Jacques Duèze (or d'Euse), was Pope from 7 August 1316 to his death in 1334. 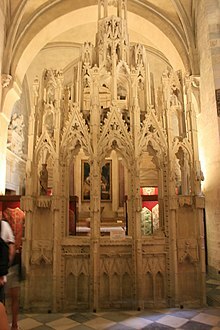 He was the second and longest-reigning Avignon Pope, elected by the Conclave of Cardinals, which was assembled in Lyon through the work of King Louis X's brother Philip, the Count of Poitiers, later King Philip V of France. Like his predecessor, Clement V, Pope John centralized power and income in the Papacy and lived a princely life in Avignon. He opposed the political policies of Louis IV of Bavaria as Holy Roman Emperor, which prompted Louis to invade Italy and set up an antipope, Nicholas V.
Pope John XXII faced controversy in theology involving his views on the Beatific Vision, and he opposed the Franciscan understanding of the poverty of Christ and his apostles, famously leading William of Ockham to write against unlimited papal power. He canonized St. Thomas Aquinas. The son of a shoemaker in Cahors, Jacques Duèze studied medicine in Montpellier and law in Paris, yet could not read a regal letter written to him in French. Duèze taught both canon and civil law at Toulouse and Cahors. On the recommendation of Charles II of Naples he was made Bishop of Fréjus in 1300. In 1309 he was appointed chancellor of Charles II, and in 1310 he was transferred to Avignon. He delivered legal opinions favorable to the suppression of the Templars, but he also defended Boniface VIII and the Bull Unam Sanctam. On 23 December 1312, Clement V made him Cardinal-Bishop of Porto-Santa Rufina. 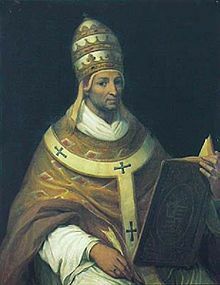 The death of Pope Clement V in 1314 was followed by an interregnum of two years due to disagreements between the cardinals, who were split into two factions. After two years, Philip, in 1316, finally managed to arrange a papal conclave of twenty-three cardinals in Lyon. This conclave elected Duèze, who took the name John XXII and was crowned in Lyon. He set up his residence in Avignon rather than Rome, continuing the Avignon Papacy of his predecessor. John XXII involved himself in the politics and religious movements of many European countries in order to advance the interests of the Church. His close links with the French crown created widespread distrust of the papacy. Pope John XXII was an excellent administrator and efficient at reorganizing the Church. He had sent a letter of thanks to the Muslim ruler Uzbeg Khan, who was very tolerant of Christians and treated Christians kindly. John XXII has traditionally been credited with having composed the prayer "Anima Christi", which has become the English "Soul of Christ, sanctify me ..." and the basis for the hymn Soul of Christ, Sanctify My Breast". On 27 March 1329, John XXII condemned many writings of Meister Eckhart as heretical in his papal bull In Agro Dominico. Prior to John XXII's election, a contest had begun for the Holy Roman Empire's crown between Louis IV of Bavaria and Frederick I of Austria. John XXII was neutral at first, but in 1323, when Louis IV became Holy Roman Emperor, the Guelph (papal) party and the Ghibelline (imperial) party quarreled, which was partly provoked by John XXII's extreme claims of authority over the empire and partly by Louis IV's support of the spiritual Franciscans, whom John XXII condemned in the Papal bull Quorumdam exigit. Louis IV was assisted in his doctrinal dispute with the papacy by Marsilius of Padua and later by the English Franciscan friar and scholar William of Ockham. Louis IV invaded Italy, entered Rome and set up Pietro Rainalducci as Antipope Nicholas V in 1328. The project was a fiasco. Guelphic predominance at Rome was later restored, and Pope John excommunicated William of Ockham. However, Louis IV had silenced the papal claims and John XXII stayed the rest of his life in Avignon. Pope John XXII was determined to suppress what he considered to be the excesses of the Spirituals, who contended eagerly for the view that Christ and his apostles had possessed absolutely nothing, citing Exiit qui seminat in support of their view. In 1317, John XXII formally condemned the group of them known as the Fraticelli. On 26 March 1322, with Quia nonnunquam, he removed the ban on discussion of Pope Nicholas III's bull and commissioned experts to examine the idea of poverty based on belief that Christ and the apostles owned nothing. The experts disagreed among themselves, but the majority condemned the idea on the grounds that it would condemn the Church's right to have possessions. The Franciscan chapter held in Perugia in May 1322 declared on the contrary: "To say or assert that Christ, in showing the way of perfection, and the Apostles, in following that way and setting an example to others who wished to lead the perfect life, possessed nothing either severally or in common, either by right of ownership and dominium or by personal right, we corporately and unanimously declare to be not heretical, but true and catholic." By the bull Ad conditorem canonum of 8 December 1322, John XXII declared it ridiculous to pretend that every scrap of food given to the friars and eaten by them belonged to the pope, refused to accept ownership over the goods of the Franciscans in future and granted them exemption from the rule that absolutely forbade ownership of anything even in common, thus forcing them to accept ownership. On 12 November 1323, he issued the bull Quum inter nonnullos, which declared "erroneous and heretical" the doctrine that Christ and his apostles had no possessions whatever. Influential members of the order protested, such as the minister general Michael of Cesena, the English provincial William of Ockham, and Bonagratia of Bergamo. In 1324, Louis the Bavarian sided with the Spirituals and accused the Pope of heresy. In reply to the argument of his opponents that Nicholas III's bull Exiit qui seminat was fixed and irrevocable, John XXII issued the bull Quia quorundam on 10 November 1324, in which he declared that it cannot be inferred from the words of the 1279 bull that Christ and the apostles had nothing, adding: "Indeed, it can be inferred rather that the Gospel life lived by Christ and the Apostles did not exclude some possessions in common, since living 'without property' does not require that those living thus should have nothing in common." In 1328 Michael of Cesena was summoned to Avignon to explain the Order's intransigence in refusing the Pope's orders and its complicity with Louis of Bavaria. Michael was imprisoned in Avignon, together with Francesco d'Ascoli, Bonagratia and William of Ockham. In January of that year Louis entered Rome and had himself crowned Holy Roman Emperor. Three months later, he declared John XXII deposed and installed the Spiritual Franciscan Pietro Rainalducci as Pope Nicholas V. The Franciscan chapter that opened in Bologna on 28 May reelected Michael of Cesena, who two days before had escaped with his companions from Avignon. In August Louis the Bavarian and his pope had to flee Rome before an attack by Robert, King of Naples. Only a small part of the Franciscan Order joined the opponents of John XXII, and at a general chapter held in Paris in 1329 the majority of all the houses declared their submission to the Pope. With the bull Quia vir reprobus of 16 November 1329, John XXII replied to Michael of Cesena's attacks on Ad conditorem canonum, Quum inter nonnullos, and Quia quorundam. In 1330, Antipope Nicholas V submitted, followed later by the ex-general Michael, and finally, just before his death, by Ockham. He died in Avignon in 1334 (aged 89/90), probably of stomach cancer. Pope John XXII was involved in a theological controversy concerning the beatific vision. Even before he was pope, John XXII argued that those who died in the faith did not see the presence of God until the Last Judgment. He continued this argument for a time in sermons while he was pope, although he never taught it in official documents. He eventually backed down from his position, and agreed that those who died in grace do indeed immediately enjoy the beatific vision. Despite holding for many years a view widely held to be heretical, John XXII is not considered a heretic because the doctrine he had contradicted had not been formally defined by the Church until his successor, Benedict XII, addressed it by the encyclical Benedictus Deus, which formally defined this doctrine as contrary to Church teaching. Although, according to Alan C. Kors, Pope John XXII was a "brilliant organizer and administrator" and the thought of witchcraft seemed to be in its early stages at this point, Kors states the pope had a personal reason for setting out to stop witchcraft. Kors points to the fact that Pope John had been the victim of an assassination attempt via poisoning and sorcery. As such, Pope John's involvement with witchcraft persecution can be officially traced to his 1326 Papal Bull Super illius specula in which he laid out a description of those who engage in witchcraft. Pope John also warned people against not only learning magic or teaching it but against the more “execrable” act of performing magic. Pope John stated that anyone who did not heed his “most charitable” warning would be excommunicated. It was also in this bull that Pope John officially declared witchcraft to be heresy, and thus it could be tried under the Inquisition. Although this was the official ruling for the Church, Pope John’s first order dealing with magic being tried by the Inquisition was in a letter written in 1320 by Cardinal William of Santa Sabina. The letter was addressed to the Inquisitors of Carcassonne and Toulouse. In the letter Cardinal William states that with the authority of Pope John the Inquisitors there were to investigate witches by “whatever means available” as if witches were any other heretic. The letter went on to describe the actions of those who would be seen as witches and extended power to the Inquisition for the prosecution of any and all cases that fit any part of the description laid out in the letter. The Royal Succession (French: La Loi des mâles), the 1957 fourth novel in Maurice Druon's Les Rois maudits historical novel series, features Duèze's rise from cardinal to pope as one of its plotlines. He was portrayed by Henri Virlogeux in the 1972 French miniseries adaptation of the series, and by Claude Rich in the 2005 adaptation. The papacy of John XXII—the conflict with Louis of Bavaria and the condemnation of the Franciscans over the poverty of Christ—is the central backdrop of Umberto Eco's historical murder mystery The Name of the Rose, which is set in 1327. Spondent Pariter - a papal decretal issued by Pope John XXII forbidding fraudulent alchemy. ^ a b c d Kirsch, Johann Peter (1910). "Pope John XXII". Catholic Encyclopedia Vol. 8. New York: Robert Appleton Company. ^ Sumption, Jonathan (1990). Trial by Battle:The Hundred Years War. Faber and Faber. p. 33. ISBN 9780571266586. ^ Arnold, Thomas Walker (1896). The preaching of Islam: a history of the propagation of the Muslim faith. A. Constable and Company. pp. 200–201. ^ Eckhart (1981). Edmund Colledge; Bernard McGinn (eds.). Meister Eckhart, the Essential Sermons, Commentaries, Treatises, and Defense: The Essential Sermons, Commentaries, Treatises, and Defense. Paulist Press. p. 77. ISBN 9780809123704. ^ Lambert, Malcolm (1992). Medieval Heresy: Popular Movements from the Gregorian Reform to the Reformation. Blackwell Publishing. p. 209. ISBN 978-0-631-17431-8. ^ a b Kleinhenz, Christopher (2003). Medieval Italy: An Encyclopedia. 1. Routledge. p. 373. ISBN 978-0-415-93930-0. Retrieved 23 June 2013. ^ a b c d "History of the Franciscan Movement (3)". Christusrex.org. 30 December 2001. Archived from the original on 22 May 2013. Retrieved 23 June 2013. ^ "Quia nonnunquam (English translation)". Mq.edu.au. Archived from the original on 6 June 2014. ^ "Ad conditorem canonum (English translation)". Mq.edu.au. Archived from the original on 6 June 2014. ^ Schatz, Klaus (1996). Papal Primacy: From Its Origins to the Present. Collegeville, Minnesota: Liturgical Press. pp. 117–118. ISBN 978-0-8146-5522-1. Retrieved 23 June 2013. ^ Tierney, Brian (1972). Origins of papal infallibility, 1150-1350: 1150 - 1350; a study on the concepts of infallibility, sovereignty and tradition in the Middle Age. Leiden, Netherlands: E.J. Brill. p. 181. Retrieved 23 June 2013. ^ "Quia vir reprobus (English translation)". Mq.edu.au. Archived from the original on 3 June 2013. ^ Coulombe, Charles (2003). Vicars of Christ: A History of the Popes. Citadel Press. p. 293. ISBN 0-8065-2370-0. ^ William, Cardinal of Santa Sabina, Letter of 22 August 1320, to Inquisitors of Carcassonne and Toulouse. Latin text in Hansen,Quellen pp. 4-5.Tr. E.P. Boudet, Jean-Patrice and Julien Théry (2012). « Le procès de Jean XXII contre l'archevêque d'Aix Robert de Mauvoisin : astrologie, arts prohibés et politique (1317-1318) », in Jean XXII et le Midi (Cahiers de Fanjeaux, 45), Toulouse, Privat, 2012, p. 159-235. Brown, Jaqueline (1991). "The Declaratio on Jon XXII's Decree Exercrabilis and the Early History of the Rota," Bulletin of Medieval Canon Law, 47 (n.s. Vol. 21), pp. 47-139. Dykmans, Marc (1973). Les sermons de Jean XXII sur la vision béatifique (in French). Rome: Gregorian Biblical BookShop. ISBN 978-88-7652-455-4. Heft, James (1986). John XXII and Papal Teaching Authority (Lewiston, 1986) (Texts and Studies in Religion, 27). Mollat, Guillaume (1963). The Popes at Avignon (London, 1963), 9–25. Nold, Patrick (2003). Pope John XXII and his Franciscan Cardinal: Bertrand de la Tour and the Apostolic Poverty Controversy (Oxford, 2003). Verlaque, Victor (1883). Jean XXII: sa vie et ses oeuvres, d'après des documents inédits (in French). Paris: E. Plon. Zanke, Sebastian (2013). Johannes XXII., Avignon und Europa: Das politische Papsttum im Spiegel der kurialen Register (1316-1334) (in German). New York-Leiden: Brill. ISBN 978-90-04-25899-0.